(Reuters Health) – Child deaths from crashes of all-terrain vehicles (ATVs), which dipped after 1985, began to climb again around 2001, and 12- to 15-year-olds accounted for more than half of all fatalities, according to a new study of Consumer Product Safety Commission data. The data include kids killed at ages six through age 18, but deaths in each age group were influenced by different risks, the authors write. “We know what all of the dangerous strategies are: no helmets, double riding, kids riding big ATVs with powerful engines, riding at night, but here they have narrowed down on fatalities,” said Dr. Brendan Campbell, director of the Pediatric Trauma and Injury Prevention Center at Connecticut Children’s Medical Center in Hartford, who was not involved in the new analysis. 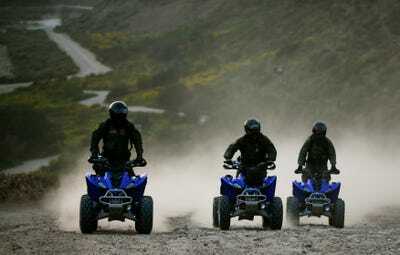 The American Academy of Pediatrics recommends that no one under age 16 operate or ride on an ATV. Compared to adults, children under age 16 are at more than 12 times the risk for injury from an ATV accident, according to a 2001 study. That high risk is likely due to physical and mental immaturity, lack of training, riding on roadways, not wearing a helmet and other factors, the authors of the new study write. To determine the major contributors to ATV fatalities among younger kids, Gerene M. Denning and colleagues from the Roy J. and Lucille A. Carver College of Medicine and the University of Iowa in Iowa City analysed data on 10,000 ATV-related deaths between 1985 and 2009 — including 3,240 in kids under age 18. When they grouped victims by age, they found 234 deaths in children younger than six, 849 deaths in youngsters aged six to 11, and 1,469 fatalities in kids ages 12 to 15. “Even among ATV riders, I think most people know that for a six- or seven- or eight-year-old, riding is very dangerous,” Campbell told Reuters Health by phone. Pediatric deaths fell by more than 20 per cent between 1985 and 1997, but returned to 1985 levels around 2000 and rose by another 40 to 140 per cent by 2006, depending on the age group. Engine size also increased around 2000, the authors note. Over the whole study, adult-sized vehicles were involved in 95 per cent of fatalities among kids younger than 16. Kids age 12 to 17 were more likely to be riding an adult-sized ATV than younger kids. “This study echoes our study in New Zealand by suggesting that behaviour is the main risk factor for fatal ATV accidents,” said Boaz Shulruf, an associate professor in the Office of Medical Education at the University of New South Wales in Sydney, Australia. The fact that the researchers identified a temporal change in the types of ATVs involved in fatal accidents, in that they got bigger over time, is a real call for action, he said. More than two-thirds of crashes among kids age 12 and older involved a collision with another vehicle or object, whereas most of the younger children died in non-collision events. Younger victims were more likely to be passengers, and older kids were more likely to be boys and to die in a roadway crash as opposed to an off-road crash. Almost one in five fatal crashes among older teens involved alcohol. More than 60 per cent of all pediatric fatalities involved a head injury. Helmets reduced the likelihood of a head injury by 58 per cent. For all age groups, 70 to 80 per cent of kids were not wearing helmets, according to the analysis in Pediatrics. The challenge now is “to translate this into public health policy,” Campbell said. One way to do that would be to make helmet use mandatory, but since that has been difficult to institute even for motorcycles, it seems even more unlikely for ATVs, he said. “In Canada, ATVs have to be registered, but there’s real resistance to that in the U.S.” he said. And statewide helmet laws do not apply to private property, where many ATVs are used, Campbell noted. “If you don’t ride ATVs and live in rural America, it’s hard to understand that these are part of people’s lives,” he said. In any case, “put a helmet on your head,” he said. For every ATV fatality, there are many more accidents, traumatic brain injuries and hospitalizations, he said. SOURCE: http://bit.ly/11Pnf4y Pediatrics, November 24, 2014.